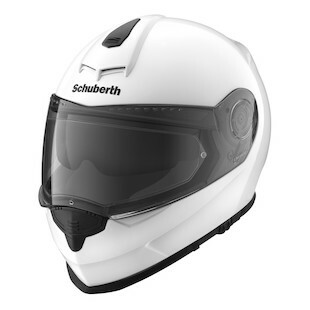 Brand new for 2012, Schuberth has released their full face version of the extraordinarily popular C3 Modular Helmet. The brand new Schuberth S2 Helmet boasts many of the same qualities as the C3, including very low noise levels and excellent stability and balance, but is designed as an ideal choice for nearly every single riding application that doesn't involve the racetrack. 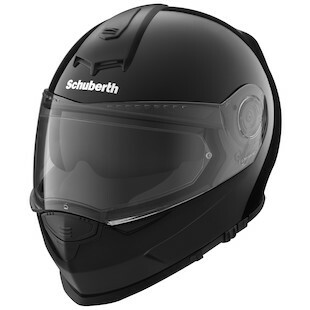 Designed and priced as a super premium lid for the most sophisticated riders, the Schuberth S2 is going to be an absolute monster in 2012. The Schuberth S2 Helmet utilizes a triple matrix shell consisting of fiberglass that is compressed in high heat settings under extreme amounts of pressure. A resin proprietary to Schuberth is added to the helmet shell in a vacuum for additional strength. Inside, the multi-density EPS liner is built for optimal shock and impact absorption. 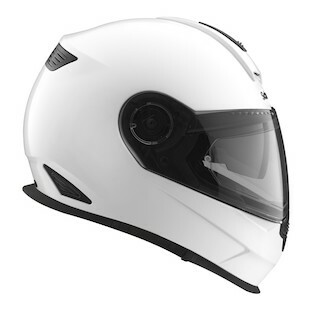 An additional safety feature is Schuberth's patented AROS (Anti-Roll-Off System) first seen in the C3. The AROS acts in a few ways to protect the rider in the event of a get-off scenario. The helmet can not rotate off the head from behind, there is a smaller angle of contact between the bottom of the helmet and the neck/chin of the rider, and it prevents trauma to the chest. 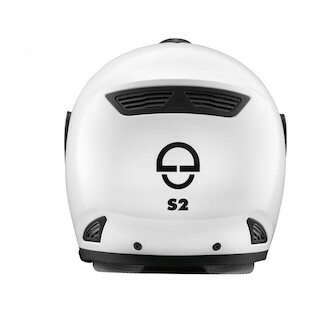 The S2 Helmet is DOT and ECE certified. Safety aside, let's get into the niceties of the S2 that may make it right for your application. First off, the quiet on this helmet is very close to meeting the 84dB of noise found in the C3. Since this is a full face helmet, the opening has to be a bit wider to get your head into it, whereas the C3 can be more snug given the fact that the chinbar flips down. In doing so, you only sacrifice 1dB of wind noise and the S2 measures in at 85dB of sound at 65mph. Pretty doggone quiet! The neck roll is fully encompassing to assist in sealing out wind noise and can be completely replaced by the SRCS Bluetooth system, which while be available in roughly six months and seamlessly integrates with the S2 as the SRC system did with the C3. This brings us to the SRCS system, which Schuberth has developed in conjunction with Cardo, and may be one of the most attractive features of the new S2 Helmet. 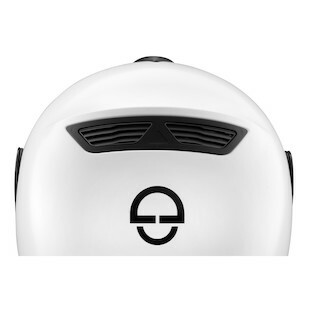 There are two antennas built into the shell for full band FM and bluetooth reception, and the S2 is the first helmet that ever comes pre-wired with a stunning 31 inches of dual band antenna. The result is reception that is comparable to being in an automobile. Also, you'll now have more than double the range of the C3's SRC system as it goes from 300 meters to 700 meters. Another key feature of the SRCS is that, since it is manufactured by Cardo, it is fully compatible with any other Cardo bluetooth units, including the SRC native to the C3. Big upgrades here. At the bottom of the helmet, Schuberth has introduced their Full Circumference Down Force Spoiler, which wraps from the front chin and around to the back. This spoiler manages down force by essentially allowing the helmet to cut through the air and deflect up and over the helmet rather than under. Were this air to creep under, you'd experience significant buffeting and turbulence. The aerodynamics are aided further by the turbulators at the top of the shield that enable the helmet to further cut through the air and thereby move through it more easily. The shield of the S2 is the exact same as the C3, as it comes with posts for a Pinlock system and utilizes the same super simple on and off mechanism. 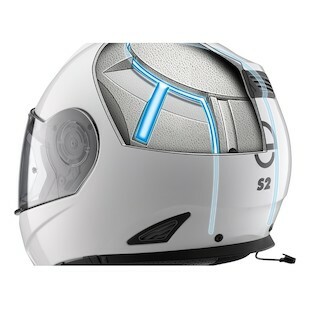 The Schuberth S2 also borrows the retractable internal sun visor used by the C3. 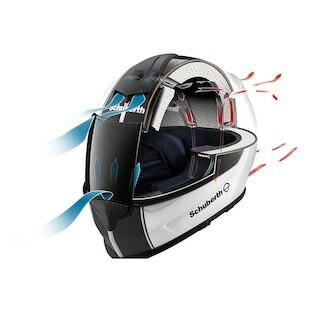 Schuberth invented the first drop-down sun visor in the late 1980s, and has continued to iterate and improve it since. The visor uses a push/pull system with small cables that raise and lower it. We've found this in the C3 to be one of the better sun visor retraction mechanisms on the market and they don't seem to wear out over time. The inner visor is coated with an anti-scratch treatment but not anti-fog, as Schuberth found that their new ventilation scheme eliminates the possibility of the visor fogging. This brings us to what Schuberth has done with the ventilation of the S2. The top intake vent on the S2 is identical to the top vent of the C3, but this helmet now features two exhaust vents built into the spoiler at the rear that were not seen in the C3. Inside, the vent channels in the EPS are cut in deeper than the exhaust vents themselves so air goes down and comes back up to create a vortex of airflow that creates more ventilation than the C3. The S2 moves 10 liters of air through the helmet while the C3 only moves roughly 7. 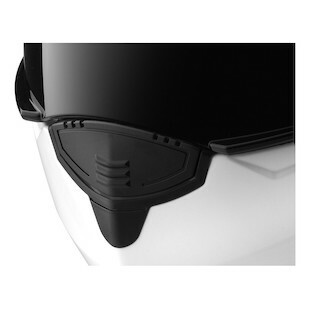 The front chin vent uses a basic open/close mechanism and is designed more to balance CO2 within the helmet and help with the anti-fog properties. Moving inside the helmet, all of the materials are made of Thermo-Cool from CoolMax® which is antibacterial, moisture-wicking and allergen free. 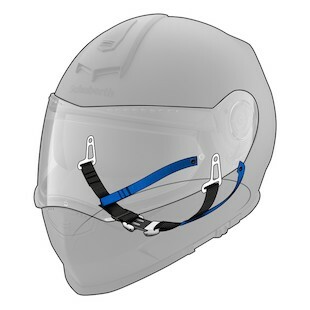 The 3D nature of helmet liner is what Schuberth refers to as skeletonized and allows air to flow to the head. 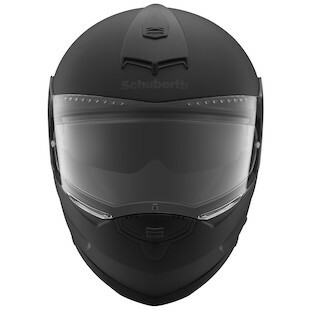 Everything inside, cheek pads and liner, is completely removable and washable; Schuberth says they can be machine-washed but must be air-dried. The crown liner replaces the C3's rubber flaps with streamlined "cat ears" that can be flipped up to close off the vents in cold weather or folded down to flow air in the hot weather. The closure is the same micro lock retention system seen in the C3 but now it is adjustable on both sides, so if you prefer it at the left or right of your chin, you can act as you please. Lastly, the fit has been updated over the C3. While it shares the general "Schuberth shape," the S2 is much more accommodating for riders with longer oval head shapes. An additional improvement over the C3 is crown liner in the forehead area, which now features thicker memory-esque foam and a trimmed down seam that prevents the pressure point in the forehead about which so many C3 riders complained. The visor of the S2 also has a few detents, including a city setting that enables you to crack the faceshield slightly when cruising at low speeds. The shield also touts an Optical Class Clarity of 1, which is the highest possible rating. The Schuberth S2 certainly features a ton of high-end technicalities that we were so pleased with in the C3. They have also addressed some minor issues that riders had complaints about on the C3. The result is one of the most super premium road riding helmets on the market today, suitable for any style of motorcycling. All Schuberth helmets are completely designed and manufactured in Germany by a small handful of elite Schuberth helmet specialists, and face a multitude of human checkpoints along the production process to ensure the highest possible standards of quality. We think Schuberth has delivered another winner. Be sure to compare against other super premium motorcycle helmets before making a final decision.